Timing is all important for the retailer, especially if you’re trying to get in and trade to take advantage of the Christmas or summer trade. Set out below are some top tips to consider before venturing across the water to ensure you can hit the ground running. Setting up a new Irish subsidiary can take as little as 3 days. If you decide to set up an Irish company to trade with in Ireland do not forget that, unlike UK companies which can execute legal documents with a single signatory, Irish companies seal their documents in the presence of two directors. So if you are using an Irish company you will need to consider that every time you enter into a deed you will need 2 directors available to sign and also your seal. Make sure you have the necessary personnel appointed. This can be a practical hassle when trying to get your deals closed. If you going down the route of trading with your UK company (or offering up the UK company as a guarantor for your newly formed sub) a landlord solicitor will often require an opinion letter that states the lease document has been validly executed and the UK company has the power to enter into the deed. We suggest that you have an agreed standard opinion letter that can be offered up-front and then it can be simply rolled out each time. If you do not have in-house solicitor that can provide one make sure you have a UK solicitor that can produce one at reasonable cost and on demand. Security of tenure takes a lot longer to acquire in Ireland. The tenant of a commercial property will not acquire any right of security until it has been occupation for 5 years. It is however becoming increasingly common that the landlord will require, as a condition of your letting, that you to renounce your right to call for a new lease. This is done by way of a deed of renunciation. Make sure you understand the implications before agreeing to give one. Make sure you find a good Irish agent who knows the market well and have their ear to the ground. In the UK all leases which are for a term of 7 years plus are registered at the Land Registry and there is total transparency with no side letters setting out concessions. It is therefore easier to find out the terms of your competitors lease. In Ireland its much harder to find out what tenants have agreed with their landlords. There is a database but practically it is very difficult to use and find the information you want. It is therefore important to have good representation with their finger on the market pulse. Rent can go up and down. Unlike the UK it is unlawful since 2010 to have upward only rent reviews. However be aware, this law is not retrospective, so if you are taking an assignment of a lease dated on or before 2010 then it is very likely that the rent review will be upward only. Secondly make sure when entering into a lease in Ireland that the rent review cannot be triggered by only the Landlord. This will prohibit you from calling for a rent review in a falling market, the net effect being that arguably, you do not have a downward rent review. The advantage of employing Irish shop fitters/ contractors rather than your regular contractor is they know the system particularly with regard to planning and regulations compliance. The planning system here is quite different to the UK. Even if you are just doing works which require building regulation approval you’ll need to appoint an appropriate certifier who can certify and sign off that works have been carried out in accordance with the building regulations. The Irish system is a regimented procedure which must be carried out correctly otherwise you will not be able to obtain the necessary documentation to satisfy your AFL obligations. The landlord will require compliance paperwork and evidence of uploading once the works are completed. They will often also want to see your contractor’s insurance so again make sure that their paperwork is to hand and if you are using UK contractors that their insurance extends to Ireland. The landlord has a statutory responsibility to complete the Form 32 (which notifies the change of ownership) and submit the same to the rating authority within 14 days of the grant of the lease. Your solicitor should get this completed form a condition of closing. You will be liable for rates even when you are fitting out. Get your VAT registration sorted early. The landlord’s solicitors will require your VAT number to stamp the agreement for lease and then lease. Unlike the UK where the tenant’s solicitors stamps the lease following closing, here in Ireland whilst the Tenant pays the stamp duty it is the Landlord’s solicitor that actually stamps the lease This means a tax number will be required on exchange for an agreement for lease or, if you are going straight to lease, on completion of the lease. Not having your VAT number ready can slow down the transaction. No double taxation here. Irrespective of whether or not the landlord has elected to charge VAT you are only paying stamp on the rent not rent and VAT thereon. The current duty payable is 1% on the first years rent plus an extra €12.50 if there is a rent review and a further €12.50 for extra counterpart. If you are entering into an agreement for lease, even a conditional one, it is common practice to pay the stamp duty to the landlord’s solicitors on exchange. Whilst the legal system in Ireland is familiar and closely aligned with the UK, transaction speed for your first few deals will be disappointing. A lack of familiarity with standard terms, Fire Safety and Disability Access Certificates, compliance requirements and other frustrations can slow the gallop. Before you find your first unit we recommend spending an hour with your lawyers to map out a realistic timetable and to-do list. Grafton Street is set for two high-profile additions over the coming months with the openings of H&M Group’s & Other Stories and US lingerie mega-brand Victoria’s Secret expected either side of Christmas. 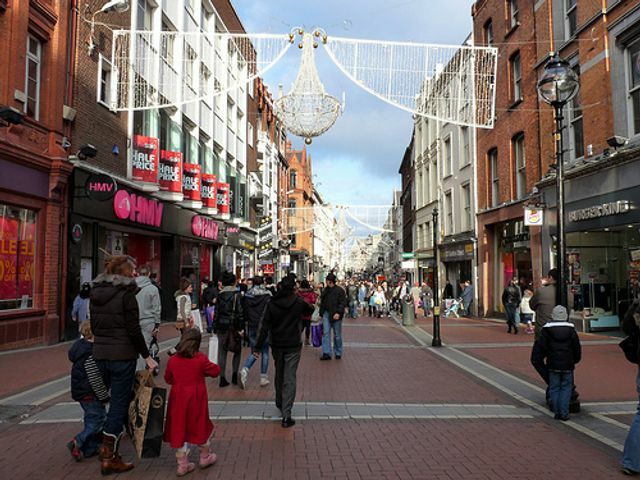 A number of other international retailers are also preparing to set up shop in Ireland. Several “very big” names have reportedly toured Ireland recently on the lookout for suitable locations, while a number of others have deals in legals, including Dr Martens, which is understood to be taking the former Sisley store at 59 Grafton Street.